I’ve been reading about the new Safe Sport initiative, which is meant to help expose and stop harassment and bullying of athletes. As the United States Equestrian Federation is part of the international equestrian sport umbrella, according to the Safe Sport guidelines, if you show in USEF competitions, you are under that policy. It’s important for stable owners, instructors, and trainers to know the policy considers them a “covered adult” for reporting purposes. And so you had better know what that means. If someone reports sexual harassment to you, you are obligated to report it to SafeSport regardless of where it happens (on showgrounds or not). And there’s special rules for children, too. The link to the USEF page about Safe Sport is here: USEF Safe Sport Any reports of sexual harassment can be directed to three specific people at the USEF, and their contact information is listed on that page. In addition, they are providing training. “A critical component of an effective Safe Sport program is education. The Safe Sport Policy requires certain categories of individuals to successfully complete awareness training every two years. USEF encourages all members to complete the training. The training can be found here and accessed using the access code 7MNA-86XI-FX4E-9GAN. ” Note: the training is required for USEF officials (judges, technical delegates, stewards) and background checks must be made on a regular basis of these officials as well. Further down the page is a list of resources including some checklists for various issues in reporting abuse and harassment. As a stable owner or trainer, you will want to read through some of the linked documents that pertain to you, and know what you should do if someone reports abuse to you. The link to Safe Sport download page is here. Their written Code is important to read. They define and explain bullying and sexual harassment. Those regulations alone are worth reading. They explain the reporting procedure very thoroughly. There are other things in the Code that is important to know, so you should download and read through it. In addition, you may want to pass on copies or links to your lawyer, and they should get back to you on what your responsibilities might be as a trainer or barn owner under the Code. If you have clients that show in USEF-recognized competitions – you are subject to the Safe Sport code, and it makes sense, since most trainers and barn owners are interfacing on a daily basis with children in equestrian sport. Do you think someone might be sexually harassing a client in your barn? What about an equestrian professional doing this to someone, and you’ve witnessed it – or have been the person that received a complaint. You might know both parties very well, and might have an opinion on what really happened. What do you do? The answer is not, “nothing”. In some cases, nothing might be the worst thing you can do. The Safe Sport initiative repeatedly lays out that a “Covered Adult” (which would be a trainer or barn owner) must report incidents, and neglecting to report things, or giving incomplete information, etc., can get you into trouble. While much of the Safe Sport initiative came about before the recent USA gymnastics scandal, that set of incidences brought publicity to the spectre of sexual abuse of vulnerable athletes. Equestrian sport isn’t immune from this. I know people in equestrian sport who have been sexually harassed, and I’ve been harassed and bullied in my career with horses. I wish that Safe Sport was available many years ago so that there was a way to report things that happened, and the system still isn’t perfect – they state right up front that anonymous complaints don’t go very far in the system. And if you are in a position where there’s only a couple of people – and a complaint is made – they are going to know who made it, which makes your life toast. So it’s not a perfect system, but as horsewomen, we are just going to have to figure a way to make it work for us – and more importantly, teach younger women to empower themselves and be better at protecting themselves from bullies and predators. I think there is also a danger of the pendulum swinging the other way, and miniscule things having the potential to be blown out of proportion. No one should be put in the position to experience the difficulty of defending oneself against a completely false accusation, which does happen. The good thing is now we have a way to stop both of those problems and protect our friends, clients, customers and competitors from being abused or harassed by wrong-headed people who probably shouldn’t be in the horse business anyway. Here’s hoping for that. I blog for Eventing Nation and Horse Junkies United, as well as horse-themed thoughts here. I’ve also started a personal, non-horse blog that focuses on food, recipes, and family history at Forever Elsie. And the blog that went around the world, “We Risk, We Ride, We Love This Sport,” with over 55,000 reads. In 1986, my interview with renowned author Christine Picavet was judged a Top Ten Article of the Year at weekly equestrian magazine, “The Chronicle Of The Horse”. I have had my writing presented to President Ronald Reagan; HRH Prince Phillip; and was given the last interview with award winning children’s book author Marguerite Henry prior to her death. I also wrote copy published in the official 1984 Olympic Equestrian Event program. This time of year, when it gets dark early and the days are short and cold, I find myself squeezing very little horse time into the day. It becomes a race to get to the barn before I have to work only by the lights. As a result, I end up just bringing them in or feeding them. They love this of course. No work and the Mom becomes the feeder and treat dispenser. The joy of this is the fact that they come when they are called and are often at the gate waiting, unlike in summer when the grass is good and they are at the far end of the pasture and deaf as a doornail to my loud calls to “come in”. Being a treat dispenser means occasionally we get a nipper. This has to be punished immediately and with great distrust, much angst, and not a little unhappiness. For a while the treats only go in the feed tub until all eager lips calm down a little. So, I am not really happy with my winter role as the Treat Dispenser. Very soon, boys, the work will be returning! Be ready!!! f you are like most eventers, weekends are sucked up by competitions, schoolings, travel, lessons, auditing clinics, riding in clinics, shopping for new tack, new riding clothes, or new horses. Cleaning the house, washing the car, working on the flowerbeds, mowing the lawn, and doing laundry are way down on the list for most of us! But when I have a bad turn of luck and terrible thoughts, I turn to cleaning to keep things churning in my mind, and letting the big chunks of sadness settle to the bottom. 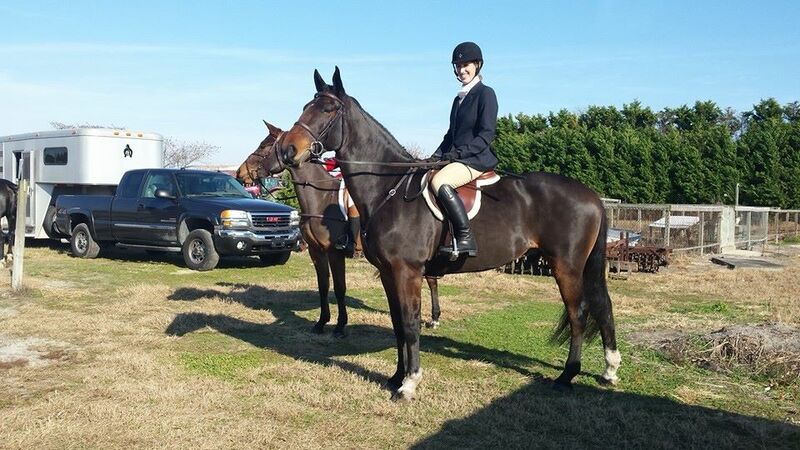 This week, I won a recognized event with the lowest score of the entire day, and a dear friend’s horse was euthanized at a huge overseas event after a terrible accident nearly at the end of a terrific cross-country course. (Rest in peace, beautiful Crackerjack.) This is a sport of very high high’s, and the lowest low’s. We all learned lessons from these two incidents, and also from the weekend’s endeavor to video tape a whole load of scenes for the new USEA jump judge video. It was very difficult to find out about Cracker at the very facility that was his home, Windurra. But we carried on, and our riders did an incredible job working their way through a long script with a lot of difficult riding questions! The event we won was Waredaca, one of the last events I ever rode Rugby at when he was alive. Hamish was a star. It was a very long day with an early start and late return home. We actually show jumped after XC, a new order of the phases for Hamish – he’s never had to do that. Thanks to great jumping lessons from Kayla Muller, we were able to keep all rails up and do a good job in show jumping, and won with a rail in hand. It had been 9 years since I’d ridden at Waredaca. What a fine return it was. Much learning this week. Watching horses do the circles and turns around the jumps at Windurra for the video was extremely interesting. Good horses do what they are taught to do, despite some real rider error. It was amazing how hard it was to make them do it wrong. (http://horsejunkiesunited.com/author/holly-covey/) I’ve been writing for this site since it’s inception. Here’s a few favorites: Sisterhood of the Traveling Shadbelly (http://horsejunkiesunited.com/2014/11/10/sisterhood-of-the-traveling-shadbelly-presented-by-smartpak/); Lucky’s Take On Going Away (http://horsejunkiesunited.com/2014/09/06/in-loving-memory-luckys-take-on-going-away/); and the blog that went around the world, “We Risk, We Ride, We Love This Sport,” with over 50,000 reads. I call it the “Circle” photo. She wanted to make sure her husband knew how much she loved and appreciated him on their wedding anniversary. But when I looked at this photo, it stood for so much more. First of all, she’s on her way down the ramp into the Rolex stadium for a dressage test ride, that hallowed place, the dream cloud location that every young (and old) eventer in America wishes they could enter. But such dreams take many details to shake into place. First, the horse; an animal you nurture, train, live and die with, care for with all of your heart and all of your pocketbook to get, sometimes, to just one corner of The Dream. If all shakes into place, the glass jar of screws spill out in perfect order, you actually get to Rolex and get to compete. And if even more stars align and fortune cookies predict, you complete the three-day event at the pinnacle of equestrian competition. And if you are vaulted into Heaven, you get a ribbon and place among the champions at the victory gallop at the end of the day. So the horse, the creature that enables all of this, is the first circle of love. (Remember, love is stable management, ala George Morris). Next, the supportive undercast to the dream has to be solidly within the circle. Not outside, smiling, waving and taking video, but living and breathing that dream on the ride with you, next to you and on occasion, behind you pushing or in front of you leading. Having a willing supporter is different from a partner who shares your dream with you, who hooks onto your star and says, “I’m coming along…it’s my dream, too.” This person or persons if your family is with you also is your tribe who go along on this trek to the Promised Land. Their smiles, words, sometimes just their physical presence beside a tense warmup ring, or sitting on the tack trunk next to the stall of the broken horse with an arm around your shoulders, is beyond your ability to appreciate. You feel so complete, so lucky to have them, so thankful they are in your life, constantly amazed at your sidekicks who are where they are when you need them. That’s the second circle. The third circle is a more silent one. It’s the overarching presence of fairness, or faith in the system that makes the competition a worthy goal. If it were a cheap thrill, or a fixed contest, there would be no satisfaction in the win, little gain for the pain. Love exists, here, too, in the officials who study the game, figure ways to fix it with rules when it breaks, safeguard the horses, the competition, the public views and educate riders who lose sight of the goal along the way. The love here is the love of the parent for the child, the mother’s guidance, the father’s pride in competition; the “family” that includes many non-family members who still care about you and your horse, and a sport, and it’s future. This love will keep this sport alive for everyone to reach their eventual goal, whether it’s walking boldly down the path with the big green Rolex signs, or just leaving the start box with a kick and a “whoo” at your local novice horse trials. A sport that is the wellspring of dreams. Keep the circles linked and you’ll get there. Ok. He’s standing. Ready – set – GO! Grab the hoof, in one smooth motion, scoop the poultice out of the bucket, while holding up the foot, don’t let it touch anything, slap the piece of paper feed bag onto the hoof, cup the paper around the hoof and quickly reach for the plastic wrap – careful now – pull the end piece and stretch it around the hoof, two wraps quickly and let’r go! Well, that’s how it’s supposed to go. In reality, it’s like this. Feed bag pieces usually mean feed to a horse. Beware. They will move to get a better look and get their mouth closer. Just in case there’s feed in the feed bag piece you might get on their foot eventually. Wrap of any kind takes two hands. Just a note to self. It takes at least one hand to pick up a hoof. Resting a poulticed hoof on your knee is …. well …. imagine poultice everywhere. Literally everywhere. Your car steering wheel. Your dog’s head. Your kitchen counter. Your coffee cup tomorrow morning…. So have the wrapping material ready and at hand. Then the horse moves and leaves you stranded! Help, help! pass me that wrap please! You stretch in your best yoga imitation, while holding the hoof, spreading your legs and reaching with your fingertips to the wrap just outside your range – careful now – balance, stretch – eeek (that ripping sound is yes a piece of clothing or could be your ACL – and….either the hoof has to be abandoned or you have to use something else closer to hand….just sayin’…..from experience…underwear doesn’t work. Once you’ve made some sort of wrap on the poulticed foot you can put it down and then the fun really begins. The horse will then squish most of the poultice out from under the sole and it’ll pretty much cover the rest of the aisle or wash rack in poultice that was not already attacked. The horse will step around a bit and move a little more, just to make sure most of the poultice continues to be spread in the environment. Do nothing. This is a natural evolution of the Poultice War and any action at this point is futile. Let the horse settle and go in for your last mop-up action. This involves covering the hoof with a boot or sturdy bag and Vetrap. This requires a professional with experience so make sure you are well prepared for this final procedure. Lift the hoof, and with both hands work the boot over the toe. More poultice will squish out and towards the heel of the hoof, usually getting on your arms and chest at this point, so all parts of your body should now be covered. This is very important. You cannot miss any part or you’ll lose. At the end, when you put the hoof down, and step back to admire your work, the poultice should be just about everywhere you view, and if you’re lucky, a few spots should be left on the hoof. This is the true enjoyment of winning a poultice war, the complete covering of your world in the white clay. I understand it now. It is all coming clear to me (as soon as I wipe my glasses off). Let the healing begin. There is something to be said for a thing that lasts a very long, long time. My hunt, Wicomico, has been around for 85 years and today was the 85th edition of the opening day hunt. Traditionally this signals the official start of foxhunting over the 2014-2015 winter season. Foxhunting is a sport that has not died with the advent of modern civilization, in defiance of all logic and certainly in the face of some really difficult times. Our nation’s Founding Fathers were highly supportive of foxhunting; George Washington left a good bit of writing behind about hunting, a subject probably that got more than its fair share of his time. Hounds were imported to this country to chase fox right here in Maryland, just beyond the Bay Bridge, actually, in the mid 1600’s. That’s right — 1600’s. Foxhuntings’ roots run very deep in America. 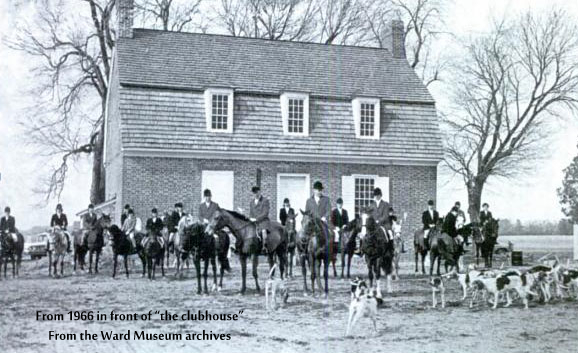 Our hunt, Wicomico, had its start in the thriving community of Salisbury, Maryland, back in the 1920’s when so much open land around the town lent itself wonderfully to the sport. Up until the 90’s much of the hunt’s usual hunting locations were in Wicomico County, in and around Salisbury. Today, however, the hunt has no land left in that vicinity. Most all of the land over which the hunt did follow hounds is now housing development, although if you drive slowly and look hard you’ll still see an occasional wooden coop at a fence corner. It’s hard to talk about Wicomico Hunt without talking about Hamilton Fox, who joined the new hunt as a young sportsman in the professional and social whirl of Salisbury. Ham guided the hunt as master for many years, riding at the end when he had to be lifted upon a horse to hunt the hounds. 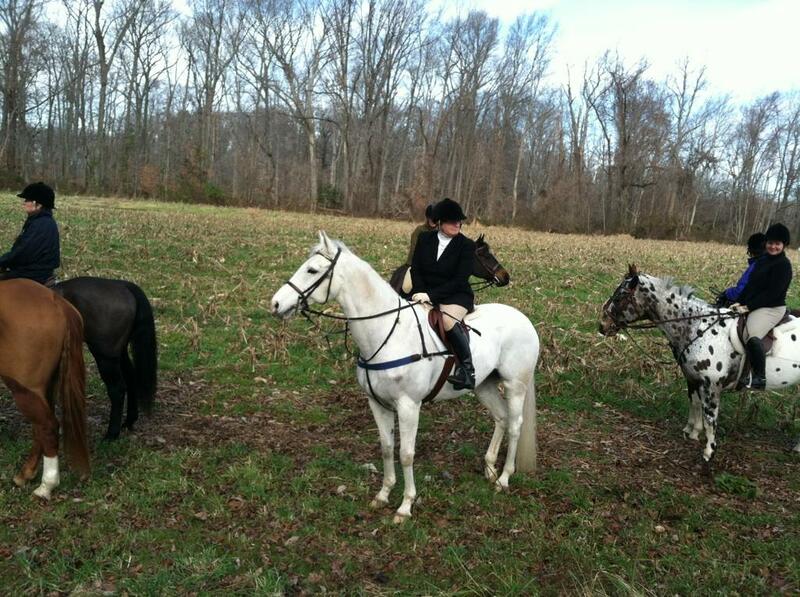 He brought many people with him to fox hunt. We lost Ham in 2013, but there is no question he was with us today as hounds cast in our first trot into the woods. A strong person often carries a good idea forward and acts as a beacon. They attract energy and support. It is no mystery Ham was such a great huntsman, and strong leader – he was a lawyer and decorated World War II military veteran who served on D-Day in Europe. It’s hard to know exactly but it is very likely Ham attended well over half of those 85 years of opening day hunts with Wicomico. No wonder I felt him those quiet moments walking single file in the woods with first field, as hounds cast for scent. Opening day is the day when everyone comes to meet up, follow hounds, and socialize after. We bring delicious food to our little barn clubhouse on private property near our state hunting land. There are trailers that pull in and park and unload all sorts of horses from every breed, and the folks who ride are from all walks of life, young and old, experienced and green. We pay honor, almost unconsciously, to the 84 years that have gone before us today, the spirits of good horses no longer in the trailer, hounds no longer hunting, men and women no longer following hounds or laughing and talking at breakfast with a beer and plate full of food. The fox is the only one who knows, completely, what the foxhunting we do is all about, the only one who controls the sport. Perhaps that is the secret survival reason for foxhunting, that ultimately, man cannot control the game and only a small woodland creature with a bright red fur has the last word. If the enthusiasm and energy of today’s foxhunters is any measure, the sport will last and thrive again another 60, 70, 80 years. Long live this hunt! Fall does not sneak in like spring, nor glide along like summer. It flips the page and drops the temperature 15 degrees, and says, “there. get ready.” The fall rye grass is already up turning the fields grey. The geese have been flocking for two weeks and it’s only mid-September. The horses are less concerned about flies and more concerned about the pesky bots and I’ve had to work on removing the yellow eggs off their legs every day. They don’t get many but it’s like a game to find them and scrape them off with the bot block. This time of year I get excited for fall eventing because it’s so nice to ride when it’s not blistering hot and sweaty. The bad news is the light fades quickly and we are losing two to three minutes a day. This year I do plan to get up some arena lights. The horses are doing well. I was able finally to write about Rugby and putting him to sleep, but really, it wasn’t me — it was Lucky who spoke about it for me. Another top-read post at HJU but it has been hard to read it and look at it. My friend Amy expressed sympathy to me for what I had to go through and even though it’s been more than a month, the tears just came, and I couldn’t help it. It is so hard to lose the things you love, and I’ve lost three of the most precious things to me in the whole world in six months. One foot in front of the other. Hamish is getting ready to hunt. Lucky getting ready to do something, not sure what. And George is also a priority and back in work as much as possible so that I can get more confident on him. Hopefully the fall, with all the fun and work at Fair Hill, will bring some good times. We are ready. My dearest Rugby. I love you and miss you.